Pick a Rest is located in the northern Olifants River Valley of Vredendal. This guest house offers three individually decorated suites with many facilities which make it feel like home. The guest house has three spacious suites. Suite one has a queen-size bed, suite two has two three-quarter beds and suite three has a double bed. All of the suites have air-conditioning, a heater, tea and coffee facilities, a television and a shower. General facilities for the guest house include ADSL Wi-Fi, breakfast, room turnover and kitchen facilities. A laundry service is available at an additional cost. Vredendal is a relatively modern town along the Olifants River wine route. This includes the large vineyards of Westcorp and Lutzville, and a number of boutique cellars that promise a great wine tasting experience. Pick a Rest is a great place to be if you are looking for real west-coast hospitality. No smoking indoors, laundry service available for an additional fee. I have stayed with Annalie before and although it's just a quick in and out (overnight business trip) it suits all my needs and I'm well taken care of. One night at Pick a Rest, enjoying the hospitality that is most relevant to the area. The very generous full breakfast. We had comfortable rooms with everything we needed for our stay. The place was clean and everything was as advertised. Breakfast was a feast fit for a king but at an additional cost. Wonderful people! Stayed here for one night while travelling to Namibia. The rooms are very comfort, lovely host. Would recommend it. 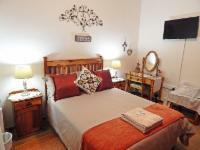 Pick a Rest is 1.6km from the centre of Vredendal , the nearest airport 255.8km (Cape Town International Airport).